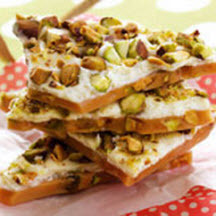 Pistachios add their unique nutty flavor and a festive holiday look to sweet, crunchy buttery toffee. Place pistachios in a single layer in a pan; toast for 3 minutes. Remove from oven, cool and coarsely chop; set aside. In a heavy saucepan, combine butter, sugars, water and corn syrup. Bring to a boil over medium-high heat, stirring constantly with a wooden spoon. Reduce heat to medium, and continue to boil until mixture reaches 300°F / 150°C (hard crack stage; use candy thermometer); stirring frequently. Stir in 3/4 cup pistachios; mix well and pour into a jellyroll pan lined with buttered foil. Spread mixture into a large rectangle. Cool completely. In a microwave-safe container, microwave white chocolate 30 seconds; stir. Continue microwaving in 10-second intervals, stirring after each, until chocolate is melted and smooth, but not hot. Using a spatula, spread over toffee, covering it completely. Sprinkle with remaining 1/2 cup pistachios and gently pat into chocolate. Place pan in refrigerator for 5 minutes or until chocolate has set. Break into pieces and store in an airtight container for up to one week.